On November 29, 2016, the Federal Government announced the approval of Kinder Morgan Canada’s Trans-Mountain Expansion Project, which plans to twin the existing pipeline built in 1953 to run from Edmonton, Alberta to Westridge Marine Terminal (WMT) in Burnaby, B.C. The project would increase the pipeline’s current capacity from 300,000 barrels to 890,000 barrels per day and increase sevenfold the annual marine tanker transits on the West Coast. Backed by oil companies wishing to increase the capacity of Canada’s pipelines, Trans-Mountain was one of several proposals presented during the Conservative government’s tenure under Stephen Harper. From the start, the expansion project has faced strong opposition from a variety of stakeholders concerned about environmental and health risks as well as the infringement of Indigenous land rights. Alarmed by the dramatically reduced scope and time of the review process carried out by the National Environmental Board (NEB), potentially affected municipalities, environmental organizations and First Nations strongly criticized the deficiencies in the process prior to its approval. Despite Liberal promises of renewed reconciliation efforts with Indigenous Peoples and commitments towards climate change, the current government made only half-hearted additions to the disputed consultation process. These measures violate international norms such as the requirement for Free Prior and Informed Consent (FPIC) in the United Nations Declaration on the Rights of Indigenous Peoples. In 2014 the then-Harper government streamlined the environmental assessment process to speed up approvals for energy projects, which came as good news to the oil industry weary of lengthy and costly review processes. Bills C-38 and C-45 drastically reduced the number and scope of required environmental assessments and made the National Energy Board (NEB) the central governmental body responsible for the safety oversight for the full life cycle of energy infrastructure projects. The NEB receives applications, assesses environmental risks and carries out the consultation of affected stakeholders. The NEB’s mandate was, however, reduced to making recommendations to Cabinet, which makes the final decision, thus politicizing the review process on development projects. Opposition parties, environmental groups and First Nations immediately condemned this as gutting the review and consultation mechanisms as well as undermining Indigenous rights. The NEB received Kinder Morgan’s application on the Trans-Mountain expansion on 16 December 2013, accepting it although key aspects such as major sections of routes or emergency response plans were missing or incomplete. Throughout the review process significant information gaps remained, and about 96% of all requests by intervenors for additional information from Kinder Morgan went unanswered. In order to meet the restricted deadline of 15 months before the final recommendation to the Cabinet had to be made, the NEB decided to not allow any cross-examination of Kinder Morgan, but instead accepted only two rounds of written information requests (IRs) from opponents. This made the credibility and proper evaluation of testimonial evidence highly questionable as the NEB would be “reviewing only untested evidence”. Legal challenges were also brought before court on the undemocratic limitation of public participation while other intervenors withdrew from the process in anger and frustration. Exercising its own discretion, the NEB only granted intervenor or commentator status to those stakeholders that were able to pass a cumbersome process showing how they are potentially affected by the project. The limited scope of the review process itself was also criticized. Upstream and downstream impacts, such as the impacts of increased tar sand extraction due to the new pipeline infrastructure or the burning of oil, were not considered in the scope of the review, nor were the general implications for climate change. After infuriated and frustrated parties started large scale protests against Trans-Mountain, Kinder Morgan filed a multiple-million dollar law suit against outspoken individuals, which the media quickly termed as a SLAPP suit (“strategic litigation against public participation”). Protestors saw this as a clear attempt to deny their Charter rights, foremost their Freedom of Expression, and as an attack on democracy as a whole. When the initial Trans-Mountain pipeline was constructed in 1953, First Nations were still prohibited by the Indian Act from organizing on land rights issues and from hiring lawyers for such actions. Since then, international as well as national laws have developed State obligations to consult and obtain the consent of Indigenous Peoples on development projects that potentially affect their Aboriginal land rights. The requirement for Free, Prior and Informed Consent (FPIC) is one of the most important principles in international law regarding development projects which affect Indigenous Peoples’ ancestral lands and inherent rights. Established in the United Nations Declaration on the Rights of Indigenous Peoples (UNDRIP), it identifies procedural and substantive measures to be actively taken by States to ensure the consent and participation of Indigenous Peoples in decision making processes affecting their territories. It is seen as an essential part of any reconciliation efforts by redressing historic injustices inflicted on Indigenous Peoples as a result of, inter alia, colonization and dispossession of their lands and resources. The Supreme Court of Canada has further interpreted the general acknowledgement of Aboriginal title rights in Section 35 of Constitution Act, 1982. In Delgamuukw (1997) and in Tsilhqot’in Nation (2014), the Supreme Court reaffirmed that Aboriginal title confers the right to exclusive use and occupation of the land, to reap the benefits flowing from the land, and to proactively manage the land. Therefore, the Crown must obtain the consent of Indigenous Peoples on their territories for development projects that would affect them. Exceptions include compelling justifications for the greater public good which the federal government must demonstrate. In November 2014, in an open letter, twelve First Nations challenged the constitutionality of the NEB’s review process, particularly regarding the Crown’s duty to consult Indigenous Peoples and to obtain their Free Prior Informed Consent about development proposals on their traditional territories. The Secwepemc Nation, which holds Aboriginal title on one of the largest territories across which the TMEP is supposed to run, also declared its opposition to the proposed pipeline expansion. Regardless of the heavy criticism from various stakeholders, in May 2016 the NEB recommended that the government approve the project subject to 157 conditions. Prior to the 2015 federal election, the Liberal party ran on a platform that made numerous promises relating to Canada’s Indigenous Peoples, including commitments to renewing Canada’s relationship with First Nations and to reconcile and create a new nation-to-nation process. Just as relevant however, are the now-Liberal Government’s combined promises to implement the recommendations of the Truth and Reconciliation Commission and, less enthusiastically, the Universal Declaration on the Rights of Indigenous Peoples (UNDRIP). In light of the Federal Court of Appeal ruling from June 23rd, 2016 that the federal government failed to adequately consult First Nations during the Northern Gateway pipeline review process, the Liberal government announced additional consultation measures before making a final decision on Trans-Mountain. Many opponents of the project were hopeful for a revision of the process, but were quickly disappointed. The three person panel, set up to respond to previously expressed concerns and to identify any outstanding issues, soon became a target of criticism as questions were raised about potential conflicts of interest of two panelists. Others were concerned with the Panel’s ability to actually do anything of substance given the short time period of two months to fulfill its mandate. Many First Nations, disappointed in the lack of improvements to the consultation process, denounced the additional measures as mere window-dressing. Despite the Trans-Mountain project obtaining government approval, it is clear that dissatisfaction has not dissipated. The project continues to face strong opposition from environmentalists, municipalities and First Nations located along the pipeline. In June 2017, the BC Liberal government was defeated in the general election, partly due to its support of the TMEP proposal. The new NDP B.C. government, led by Premier John Horgan and supported by the Green party, strongly opposed the pipeline expansion and stated that they will do anything in their power to stop its construction. Several legal challenges are still ongoing, brought by environmental groups on failed obligations under the Species at Risk Act and by the City of Burnaby withholding outstanding permits that Kinder Morgan still needs. On September 26th 2017, the Federal Court of Appeal ruled in favor of the Coldwater Indian Band, which challenged the consultation process conducted by NEB. Separately, the so-called "Tiny House Warriors" from the Secwepemc Nation have chosen direct action against the pipeline project and built small houses in the path of construction to block expansion on Secwepemc territories. Just recently, Alberta Senator Black has introduced a Bill through a section in the Constitution that hasn’t been invoked in decades, in a blunt move to declare the Trans-Mountain Expansion Project a general advantage for Canada and to further isolate and pressure the NDP government of B.C. opposing the project. 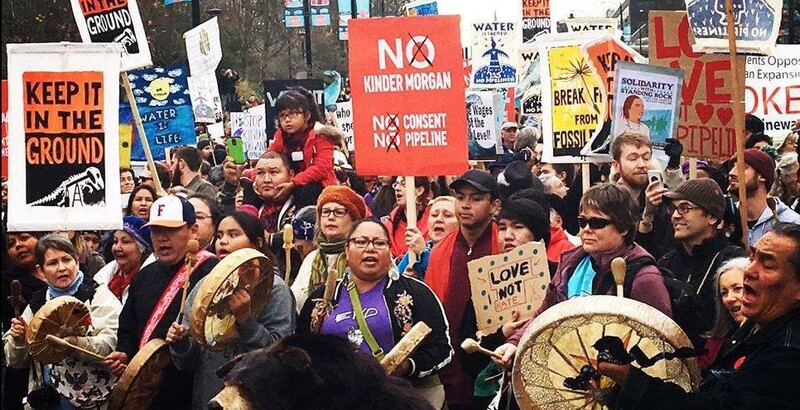 However, as protests continue, Kinder Morgan has announced its intention to suspend all “non-essential” spending on Trans-Mountain Expansion Project, setting a deadline for May 31, 2018 to reach an agreement with the various stakeholders involved. As the Federal Court of Appeal noted again in its decision of June 23rd, 2016 on the Northern Gateway pipeline, the Crown has the constitutional responsibility to adequately consult First Nations on developments affecting their Aboriginal territories and rights. However, the principle of Free, Prior and Informed Consent constituted in the United Declaration on the Rights of Indigenous Peoples is yet to be fully acknowledged by Canada and implemented in law. Principle 6 of the 10 “Principles respecting the Government of Canada's relationship with Indigenous peoples” goes further than the general “duty to consult”. However, it mentions only the will of the government to “aim[s] to secure” FPIC of Indigenous Peoples while falling short of the wording in the UNDRIP which obliges states to consult them “in order to obtain” their FPIC. Regarding the heavily criticized Trans-Mountain review process, the Liberal government missed the chance to follow up on its promises of a new relationship towards Indigenous Peoples, and instead traded commitments towards actual reconciliation efforts for promises to get Canadian resources to the markets. Reconciliation can only be accomplished when Indigenous Peoples can freely decide to give or not give their consent on developments affecting their traditional territories to which they hold title to. May 19, 2016: The NEB issues its report finding the Trans-Mountain Expansion in the public interest and recommends that the government approve the project, subject to its 157 conditions. November 29, 2016: The federal government announces its approval of the Trans-Mountain Expansion Project. This delegation of its duty to consult with First Nations from the federal government to the NEB was highly criticized and contested in court. Reconciliation: In light of the 2015 Report of the Truth and Reconciliation Commission, it has become apparent that Canada must come to terms with its colonial history in meaningful legal, economic and political respects. Reconciliation requires changes from past colonial practices. The right of FPIC implies both the right to consent and to withhold consent of major developments on their unceded territories. Accountability and Transparency: The reduction of the NEB’s mandate to merely provide recommendations to the Cabinet which makes the final decision has politicized the review process. The NEB review and consultation process lacks transparency and procedural integrity. Many affected stakeholders were refused permission to participate. Participants were not permitted to cross-examine Kinder Morgan Canada, leaving questions on fact-finding and assessments of the proposal unanswered. Democracy: By failing to consult with Indigenous Peoples to obtain their Free, Prior and Informed Consent, the government violated the international norm set out in the United Declaration on the Rights of Indigenous Peoples. It also violated its constitutional obligation to, at a minimum, adequately consult First Nations on developments affecting their traditional territories. Moreover, civil society critics of government must be able to express their dissent and advocate their positions without fear of intimidation and lawsuits by large corporations. Kinder Morgan’s multi-million dollar SLAPP suits against protestors are seen as undermining protesters’ Charter rights, particularly the right to Freedom of Expression and the Right to Assembly. CBC News, “Court of appeal rules against Kinder Morgan, federal government on existing Trans Mountain pipeline”, CBC News, September 27, 2017. CBC News, “Kinder Morgan lawsuit protested by Burnaby Mountain anti-pipeline activists”, CBC News, November 5, 2014. Defenders of the Land & Idle No More Networks, “Press Release: Defenders of the Land & Idle No More Condemn Government of Canada’s 10 Principles”, August 25, 2017. Indigenous Network on Economies and Trade, Standing Rock of the North, October 2017. Jason Proctor, “Northern Gateway Pipeline Approval Overturned”, CBC News, June 30, 2016. Mike De Souza, “Kinder Morgan warns of massive losses and blames Burnaby for pipeline delays“, National Observer, October 27, 2017. National Energy Board Report: Trans-Mountain Expansion Project, May 20, 2016. Natural Resources Canada, “Government of Canada Announces Pipeline Plan that will Protect the Environment and Grow the Economy”, November 29, 2016. Natural Resources Canada, “Joint Federal/Provincial Consultation and Accommodation Report for the Trans-Mountain Expansion Project”, November 2016. Natural Resources Canada, “Report from the Ministerial Panel for the Trans-Mountain Expansion Project”, November 1, 2016. Nia Williams, “Environmentalists File Suit over Trans-Mountain Pipeline, Calls Expansion a ‘Death Knell’ for Endangered Species”, Reuters, December 20, 2016. Sacred Trust Initiative, “Constitutionality of Kinder Morgan Trans Mountain Review Process in Question: Open Letter “, November 28, 2014. Sierra Club BC “Credibility Crisis”, June 2015. CBC News, "B.C. Trans Mountain opposition remains steadfast as Kinder Morgan suspends 'non-essential' pipeline work", April 8, 2018.